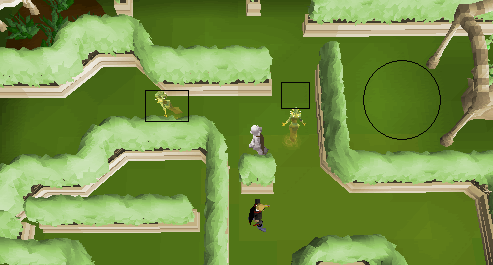 Deciding What to Go For: Sq'irk or Herbs? Argh! the Elemental Has Jammed! 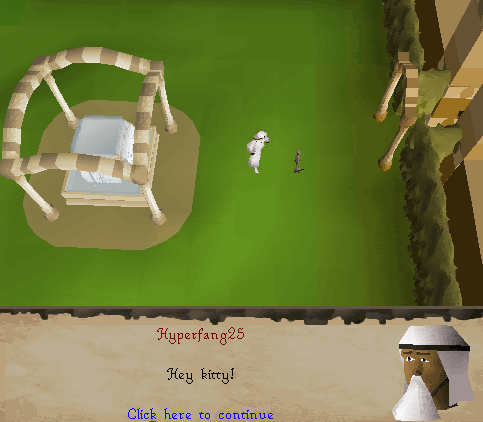 Start by talking to Osman, from the Prince Ali Rescue Quest. 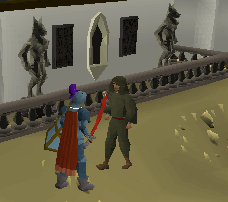 He is located just in front of the royal palace in Al Kharid. Talk to him and eventually he will talk about the Sq'irks. He says that a Sorceress is growing them in her garden. But she won't give it to him anymore. 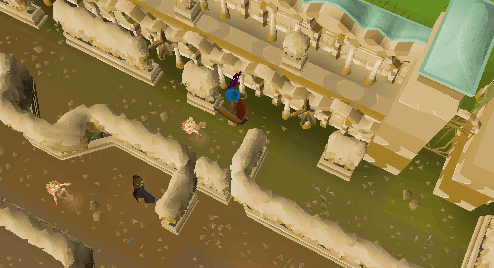 So now you must find the house of the Sorceress which is Near the Shantay pass (still in Al Kharid). So basically it is southeast of Osman. Now, before you go, get a Pestle and Mortar (if you don't want thieving experience, you'll want the herbs, you won't need the Pestle and Mortar). Then search the shelves in the house to get a beer glass(unlimited amounts. Again, if you want the herbs, no need for the Beer Glasses). Now talk to the Apprentice since the Sorceress will be of no use to you. Keep choosing all the nice things and soon she will mention her teleportation powers. 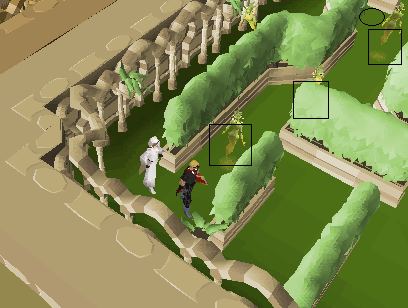 Ask her to teleport you to the garden and she will. Now you must pick fruits and make them into juice (unless you want herbs). Here are the maps. 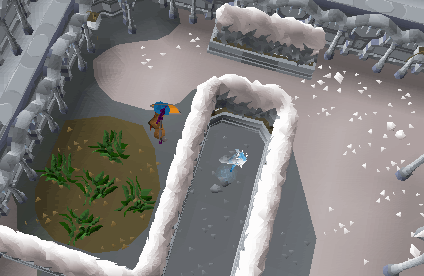 If you wish to return back to Al Kharid, just drink the water in the fountain. Now, Del-Monty is located in the garden capital, He will give you some useful advice....but, he can't speak to you unless you bring The Catspeak Amulet from Icthlarin's Little Helper. Due to the Sq'irks being virtually raw, I recommend you not going for the Sq'irk fruit just yet, since you will need five fruits for one glass of Winter Sq'irk Juice. Herbs on the other hand aren't too great either, but with a bit of luck, you can yield a few Tarromins and Harralanders. 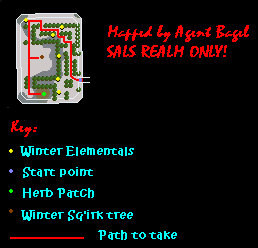 Perfect for that Herblore level you've been meaning to level up. 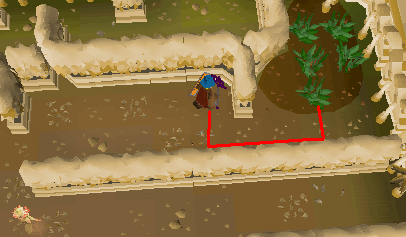 I have a special secret about the Winter Garden... Err, follow this simple guide! 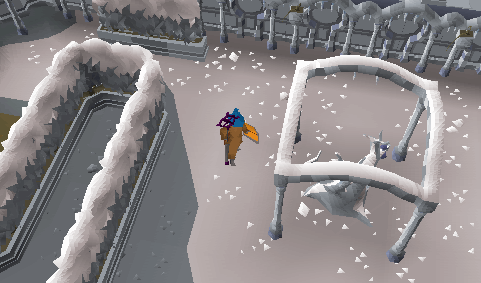 First step, check where this Elemental is (use the winter map for this). 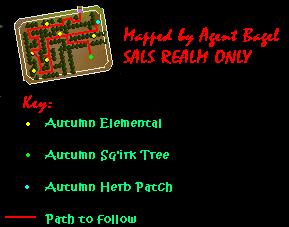 Second, if it matches the pictures, then click the Herb Patch. If done correctly, you should miss all the Elementals, and get there 90% of the time! 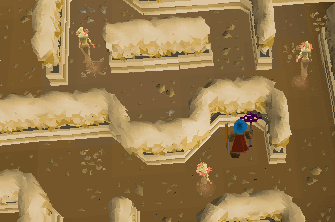 Aside from the herbs, Sq'irks and thieving experience, you will also receive a small amount of Farming experience when you Pick the Herbs and Sq'irk trees! 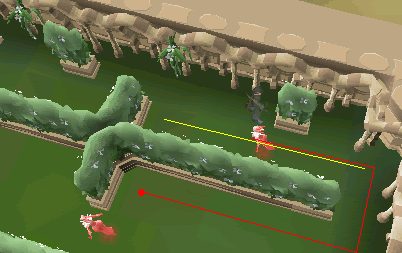 Level 25 thieving is required, as we thaw out, and enter the land of the newborn bunnies, and sheep, in the garden of Spring! The sq'irks this time are much better. 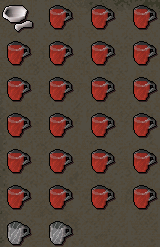 Now instead of 350xp for one drink, you get 1,350 xp. This comes in handy if you are a 1-40 thief. The herbs are better as well, your chances of getting harralander and tarromin are raised quite a bit. 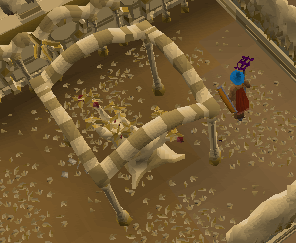 If you're lucky, you may even get an avantoe herb. Step One: Move to the first area. Spirits can't catch you here. 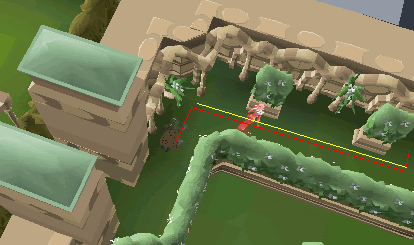 Step Two: Now, move to the second spot, start running when the spirit is near the plant, as circled in blue below (for colorblind people, look for the circle that has dots and a line in the middle of the circle, this is where you should go). Step Three: Move to the third spot. Start running when the spirit goes a little bit after the plant (for colorblind people, look for the circle that is filled in, this is where you should go). Step Four: Move to the fourth spot, the squares indicate where the spirits should be when you start running, and the circle is where you go. Step Five: Move to the fifth spot. 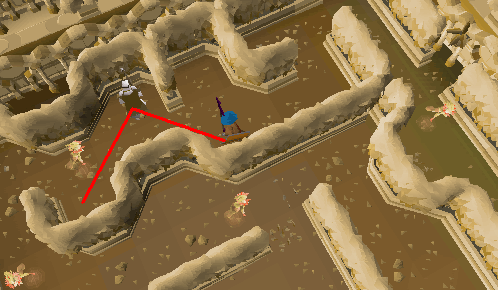 The squares indicate where the spirits can be before you start running. The circle is where you go. Step Six: Move to the sixth spot. 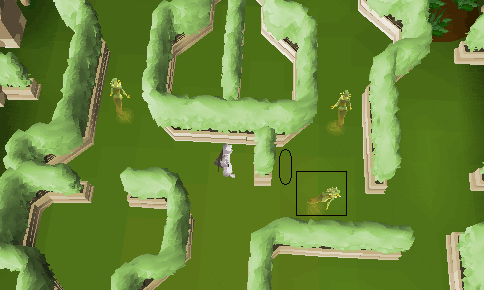 The squares indicate where the spirits can be before you start running. The oval is where you go. 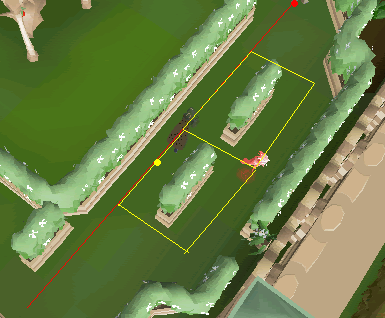 Step Seven: Time to move to the tree, The squares indicate where the spirits can be before you start running. The oval is where you go. Step Eight: Now, if you have no interest in the fruit, then you can go for the herbs. 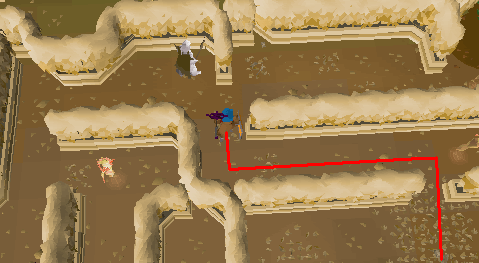 The squares indicate where the spirits can be before you start running. The oval is where you go, make sure that you are at tree though. The Sq'irk Fruits are now over-ripe. This is the second best time to drink them. But, the better the drink, the harder the maze, which you should know by now. 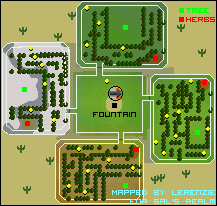 As you can see, this is a more complicated map than the ones mentioned before. But, I can promise, you will be able to do this, in seven simple steps is you wish to gather herbs, and six if you wish to get Sq'irks! Step One: Just wait till the elemental comes toward you. 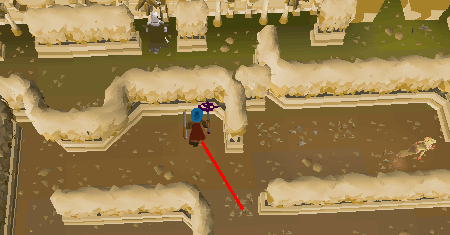 When it does, click the purple dot, you should be right behind the elemental. Step Two: Follow the zigzag. The picture shows the run option on 'walk' at this point, it doesn't matter weather you are running or walking. Though it is recommended that you run. Step Three: Wait until both elementals are about to go away from you, and click where it shows. You MUST be on run for this step. Step Four: Real simple, just wait for the elemental to be at the spot where you wish to be. As soon as it is, just click. Step Five: There are two elementals to be aware of. The one you encountered in the last step, and a new one which moves in a horizontal path. 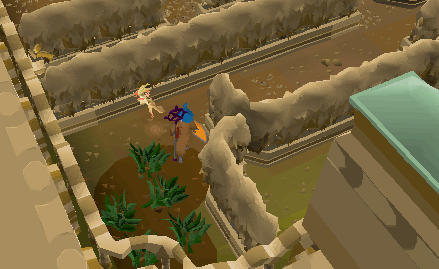 Just wait until it's going towards the herb patch. 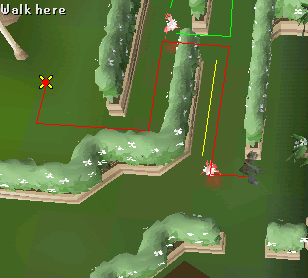 Step Six (Sq'irk path): If you are wishing to gather Sq'irks, walk into the gap between the two hedges. Then, repeat what you did in step one, apart from instead of clicking where the purple spot was, click the tree. You again should be right behind this elemental, and should do it. 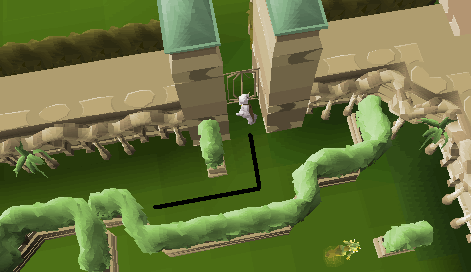 Step Six (Herb path): Simply wait for the elemental to go past, and click on the other side of the wall. Once you are there, you can move up and down that row, and the elemental won't get you. 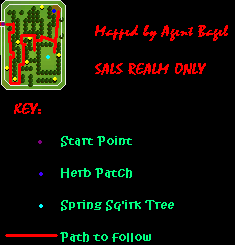 Step Seven (Herb path): Wait for the elemental to go past, and click the herbs. Sometimes, due to a huge amount of people, the elemental can get jammed in step two. 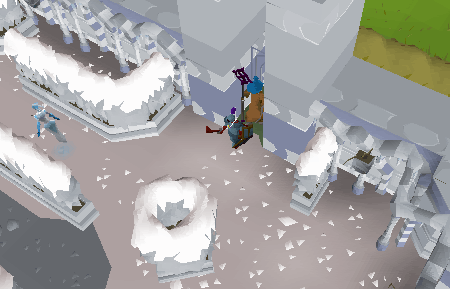 If it was after you, simply log out, and back in again. If it was someone else, just stay still, and politely tell them to log out and in. Or, you could run into it's path, which will reset it, but this isn't recommended. 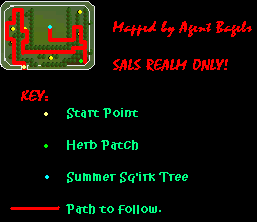 A few more thieving levels, and you will experience blinding lights, and warmth, as we enter The Garden of Summer! 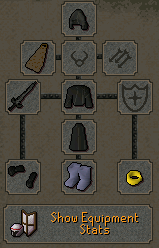 Ghostly robes (optional) - They look cool and weight 0kg. Shadow Sword (optional) - Again, looks cool and weighs 0kg. 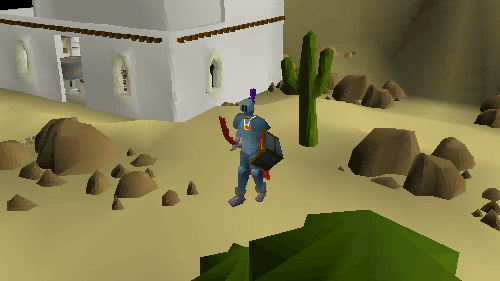 Spotted or Spottier Cape - decreases your weight. Boots of Lightness - decreases your weight. 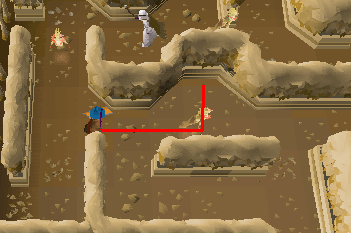 Run past the first elemental, the moment she reaches the point shown below click where I have on this diagram, you Then continue north along the path, until you reach the next small chunk of wall. This is once again a simple click, there is another way to get around but this is the safest and just as fast. The Elemental patrols in a eight shape. 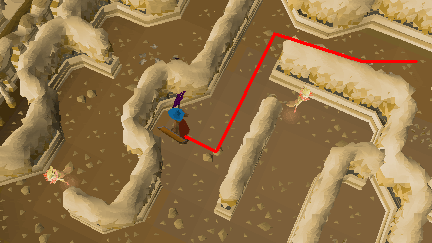 Once the elemental reaches the yellow dot marked on the picture below, run to where the red dot is located. 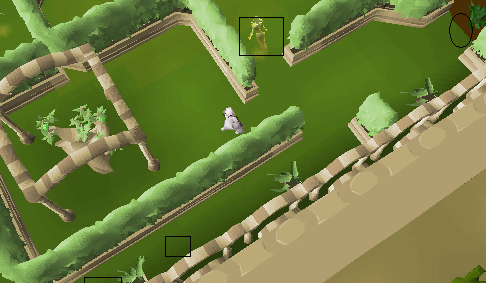 Once the Elemental has started to walk back along its patrol, it is safe to run to the squares closest to the hedge. 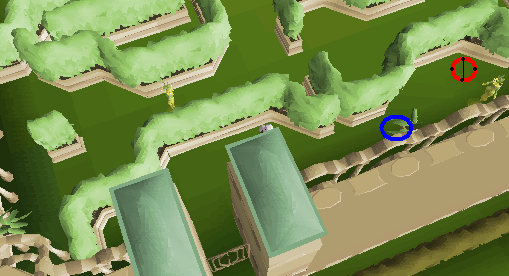 Note: if you are after herbs there are right here, in the southern enclosure of walls. 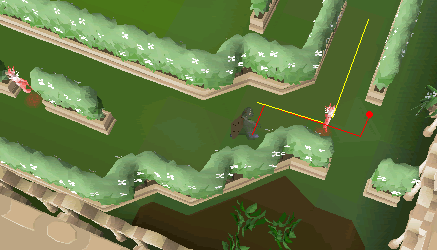 The last part, when the elemental nearest you heads to south, the moment it comes in line with you click either inside the area with the tree or on the tree it's self, timing must be right! 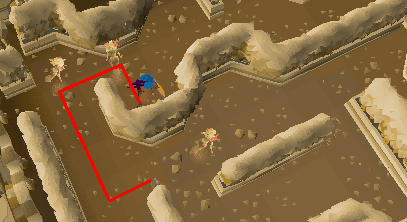 You will run through the space in the middle section if you don't feel confident you can stop here and wait for the second elemental to pass (marked as green line) she wont teleport you in that small hole in the wall. Next get your fruit and away you go!